Even the smallest delay in page or content loading can deter a customer from buying-and traditional content caching alone will not prevent this from happening. 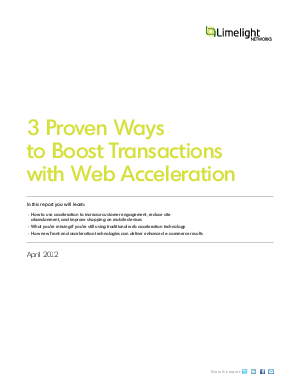 Download our free report, 3 Proven Ways to Boost Transactions with Web Acceleration, and see how new front-end acceleration technology can significantly improve Time to Action. On the Internet, slow can cost you. See how storefront operators like you are using accelerated content delivery to maximize results.